NAO’s vision is that Oregon’s nonprofits are visible and valued as essential contributors to our society. 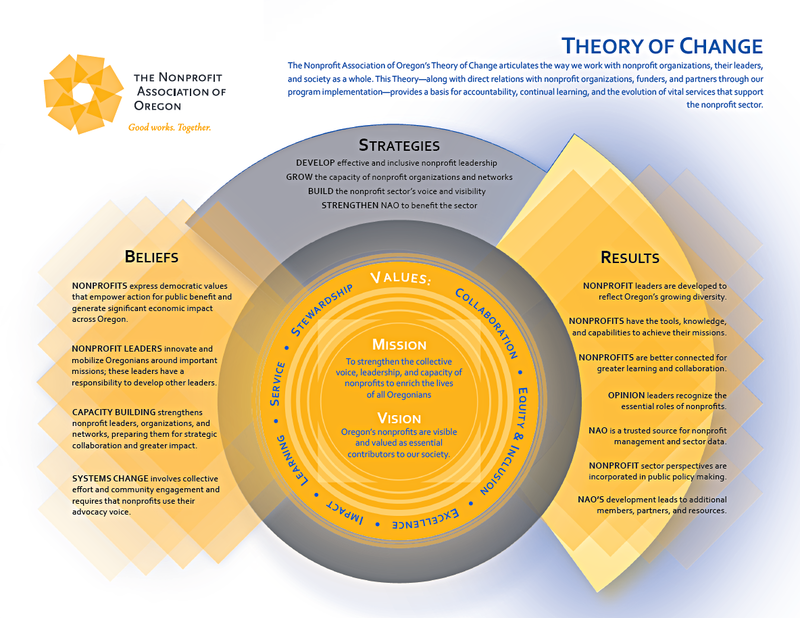 The Nonprofit Association of Oregon’s Theory of Change articulates the way we work with nonprofit organizations, their leaders, and society as a whole. Our Theory expresses the results we are working toward and the underlying beliefs that animate our mission. This Theory of Change—along with feedback loops that keep NAO in touch with organizations, funders, and partners throughout Oregon—provide a basis for accountability, continual learning, and the evolution of vital programs and services that support the nonprofit sector. NAO recognizes that Oregon’s nonprofits are under ever‐increasing pressures to make timely, strategic decisions to maximize the impact of their charitable missions. NAO accomplishes our mission in service to nonprofits through four key strategies, each of which includes several supporting strategies. NAO’s mission, vision, strategies, and results are grounded in a set of beliefs about the value of nonprofit organizations and the sector, the importance of leadership development and capacity building, and the essential role of advocacy in achieving the collective aspirations of Oregon nonprofits in serving the public good. We believe the nonprofit sector strengthens the fabric of our democracy and our communities. Nonprofits create many public benefits such as opportunities to participate in civic affairs, enrich cultural life, stand up for the underrepresented, provide needed services, generate significant economic impact, address inequities, and create innovative solutions to community issues. Nonprofit leaders are passionate and creative; they excel at mobilizing Oregonians around important missions. In our increasingly diverse state, we need leaders that reflect our evolving demographics. Because we live in a more networked world in which collaboration is our context, leadership capabilities must be developed among multiple leaders in addition to executive leaders. Investments in leadership development and capacity building are crucial to the effectiveness, adaptability, and resilience of Oregon nonprofit leaders, organizations, networks, and the sector as a whole. Through leadership development we nurture new nonprofit leaders and sustain experienced leaders. Through capacity building we grow the capabilities and systems needed to achieve shared visions, collaborate strategically, develop resources, and deepen community impact. Advocacy is an essential function of the nonprofit sector. Complex issues require systemic change including policy change. By working together in the public policy arena, nonprofits amplify their voices and increase their influence. Our core values are the principles that guide our internal and external actions and drive our accountability to each other and our stakeholders. We are inspired by these values and we aspire to fully live these values. Collaboration: We are better together. We encourage strategic collaboration to bring out the best solutions and strengthen the fabric of our communities. Equity and Inclusion: We value diversity in many forms. We are committed to strengthening nonprofits as change agents that contribute to a just and equitable society. Impact: We make a difference. We focus on results that matter to nonprofit leaders, organizations, networks, the sector, and ultimately, society. Learning: We are curious, ask good questions, and listen well. We believe continual learning is essential for adaptation, innovation, resilience, and relevance. Service: We are responsive and flexible. We build relationships. We meet people where they are, developing experiences, content, and outcomes that advance nonprofit missions. Stewardship: We are effective stewards of the financial, human, and natural resources.